In this new collection of essays, Kohn takes on some of the most important and controversial topics in education of the last few years. His central focus is on the real goals of education-a topic, he argues, that we systematically ignore while lavishing attention on misguided models of learning and counterproductive techniques of motivation. The shift to talking about goals yields radical conclusions and wonderfully pungent essays that only Alfie Kohn could have written. 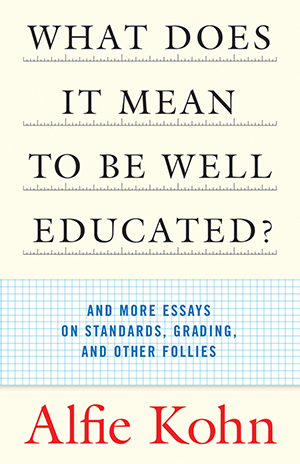 From the title essay’s challenge to conventional, conservative definitions of a good education to essays on standards and testing and grades that tally the severe educational costs of overemphasizing a narrow conception of achievement, Kohn boldly builds on his earlier work and writes for a wide audience. Kohn’s new book will be greeted with enthusiasm by his many readers and by any teacher or parent looking for a refreshing perspective on today’s debates about schools.